Father Joseph Sheets has ministered as a priest in central and southern Indiana for more than 50 years. But while his ministry assignments have taken him to various corners of the archdiocese, he has only served in six parishes and ministered as the pastor of only two parishes: St. Mary Parish in Lanesville and St. Ambrose Parish in Seymour. 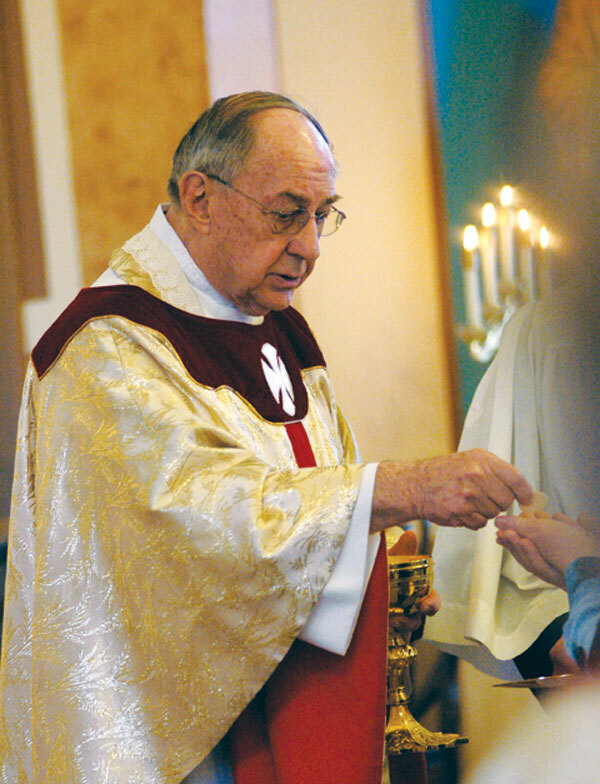 Since retiring in 2001, Father Sheets has assisted in several of the archdiocese’s 151 parishes, often celebrating weekend Masses when a faith community’s pastor or sacramental minister is away or sick. So it has only been in the past decade that Father Sheets, in his continued ministry in retirement, has come to see many of the Catholics across the archdiocese who contribute to the care of retired priests through their participation in the “Christ Our Hope: Compassion in Community” annual appeal. In the appeal, the archdiocese is organized in five regions based on its deaneries: Batesville and Connersville, Bloomington and Seymour, Indianapolis, New Albany and Tell City, and Terre Haute. The financial goal for each region to support the ministry of celebrating the sacraments—caring for retired priests and providing for the formation of permanent deacons and future priests—is based on the number of households in that region. In the past year, the 78-year-old priest has come to appreciate the care that the archdiocese provides even more as he has experienced some health challenges. The health insurance provided to retired priests by the archdiocese covered the costs of his medical treatment. Father Eric Johnson doesn’t know what he would do without Father Sheets’ regular assistance at St. Agnes Parish in Nashville. Father Johnson, the archdiocese’s vocation director, is also the sacramental minister at St. Agnes Parish. But in his duties as vocations director, he needs to be out of the parish about one weekend a month. Father Sheets has agreed to fill in for Father Johnson when he needs to be away promoting vocations to the priesthood across the archdiocese. Part of that vocation work is supporting the archdiocese’s seminarians—its future priests. If a priest like Father Sheets, who has ministered for more than 50 years, has served in only a small fraction of the archdiocese’s parishes, a seminarian like Jerry Byrd will likely have experienced even less of the Church in central and southern Indiana. Nonetheless, Byrd is encouraged by the fact that people he has never met contribute to his continued priestly formation through their contributions to Christ Our Hope. Byrd, who is in his fifth year of theological studies at Saint Meinrad Seminary and School of Theology in St. Meinrad, expects to be ordained to the transitional diaconate next spring. Seminarian Adam Ahern, a member of St. Anthony Parish in Morris, is still a number of years away from ordination. He will soon complete his formation at Bishop Simon Bruté College Seminary in Indianapolis. Ahern’s home parish is in southeastern Indiana in a far corner of the archdiocese, and is closer to Cincinnati than to Indianapolis. But knowing that Catholics in Terre Haute, Richmond, Bloomington and Jeffersonville are all supporting his priestly formation through Christ Our Hope means a lot to him. “It’s such a great encouragement and blessing to know that these people are supporting their Church,” Ahern said. “It’s a humbling feeling to know that they’re putting so much behind me and yet they may never get to meet me. During his time at St. Meinrad, Byrd has seen the number of seminarians from the archdiocese in formation there gradually increase. The cost of their studies and formation are supported by contributions to Christ Our Hope. Byrd said that this growing community of seminarians “shows me that there are more men who are at least willing to give [discerning a call to the priesthood] a try.